David Bowie - by Jon Simonds, The Basically Brooklyn Series. If there truly is a God gazing down upon us and a dark lord walking amongst us, humanity has been blessed and well-armed with a gift for love illustrated by those who have touched us, inspired us and led us through our darkest hours. After all, "There is nothing you can do that can't be done. There is nothing you can sing that can't be sung - nothing you can do but you can learn how to be you. It's easy." Maybe there truly is some un-visible battle between good and evil and evil is on the upswing because evil breeds selfishness and greed and an ignorance of humanity in all its frailty and human need. We throw dollars at lotto venders, ignoring the homeless and hungry we pass as we slip into the local bodega with a ticket full of numbers to fulfill our fancy dreams. We sing the praises of hatred and divisiveness in Presidential campaigns offering little in real solutions to problems affecting too much of humanity for the benefit of far too few. "Some things take so long. But how do I explain. When not too many people can see we're all the same." "Few will have the greatness to bend history itself, but each of us can work to change a small portion and in the total," we can effect change. These are the lessons handed down from the greatest generation, inspiring a lost generation to gather en-mass and effect change, and they did effect change from the Civil Rights movement all the way to the Market Basket revolution. It begins with a voice or a song rising above the censure of corporate power, of Citizens United, of those who choose to walk the path of darkness. Has the whole concept of love become "such an old fashioned word that dares you to care for the people on the edge of the night"? "Dares you to change your way of caring about ourselves"? Is this our last dance? We've lost another hero though his voice will never be silent. 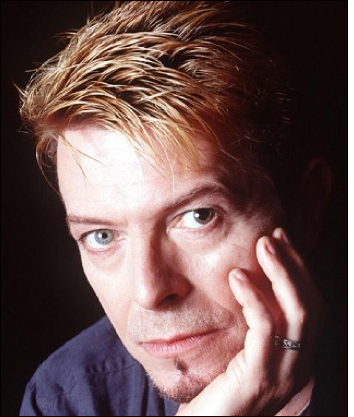 David Jones, who changed his name to David Bowie due to the success of singer Davey Jones of the Monkees, opened the door of glam-rock, imagery and fashion. Long before Eminem gave us Slim Shady, Bowie brought out Ziggy Stardust, his imaginary best friend with no shame, nor guilt. His films included the Hunger with Susan Sarandon, The Man Who Fell To Earth and Merry Christmas, Mr. Lawrence. Rest in Peace, Mr. Jones, because you had so much to offer and nothing much to take. You've left us with a legacy of music; a voice raised above the masses to inspire, comfort and move. I will never stop believing in the "madness that calls now" or that there is indeed "a light shining through somehow."